News alert: Smartphones are getting smarter and more powerful! Hmmm… not new news? How about this one, “Cloud computing is becoming more popular!” Did I hear someone snoring out there? OK, we’ve all heard these stories for so long now that it is wearing a bit thin. Or so I thought until recently. When you look at the very latest phones, and their accessories, smartphones have crossed the invisible line between gadget and something more. Or maybe something less; a tiny but capable PC. You can argue endlessly, as some people have, that THE smartphone is an iPhone, an Android or maybe some less known product. Given how quickly every manufacturer rolls out copy-cat features, it really doesn’t matter which phone is best. 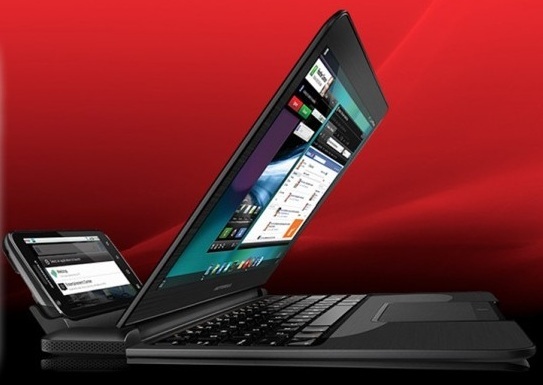 High-end phones have 1 GHz or faster processors, delivering PC-like performance (or at least netbook performance). The Thunderbolt is the new performance champion with dual-processors, nearly a GB of RAM and the latest Android operating system. Impressive, but the Motorola Atrix provides similar features plus some special accessories, such as a docking station that turns the Atrix into a laptop. Can it replace a dedicated laptop? I’ll leave it to the tech Blogs to answer that question, but I’ll bet that a new laptop hybrid with a non-standard operating system will need to work out some teething problems before it’s ready for the mainstream. Still, big winner or just an also-ran, the Atrix will move along the convergence between smartphones and PCs. Another event moving along this convergence is the growing acceptance of the “Cloud”. Scrape off all the hype, and Cloud computing looks like 1980’s style mainframe computing. Take a smart-terminal (screen, keyboard, limited processor/memory) on one end and one or more timesharing computers (for processing and permanent storage) on the other end, and Presto… a mainframe network! That’s pretty much the Cloud model. Granted, the Cloud is more random due to its less defined structure… and ownership!… but underneath it all, it’s pretty much the same model. A smartphone diminutive size and 4G connectivity mean you’re connected to the cloud all the time from just about anywhere. That’s a very compelling argument for the smart-phone as your main terminal. This entry was posted in Best Practices, Decision Making, Delivering Services, Improvement, Continuous or Not and tagged Android, change, Cloud Computing, corporations, iPhone, Mainframe, Networks, Smart Phones, transform. Bookmark the permalink.